Constance has set two lit candles in the window for Independence Day…this is a signal that people may find a safe haven in this house during times of oppression. Hyvää Itsenäisyyspäivää – Happy 101 years of Independence, Finland! On Finnish Independence Day 2011 Constance and Tansy became involved in a great Reindeer Saga, the entire story can be seen by following this link Start by reading the bottom post first – they are in reverse order for some reason. Thank you, the Quimper Hittys love their cupboard! Safety and independence are of great value….this is a beautiful setting in honor of those hard sought after aspects of life. Thanks very much, we are proud of our Finnish heritage! One of many reasons I love Hittys so much is how compassionate, kind and thoughtful they are. This is a lovely story. Happy Independence Day. Finland found a way to gain independence, one hundred and one years ago! I had nearly forgotten the Reindeer saga!! What fun to revisit it…and to see Dora again. 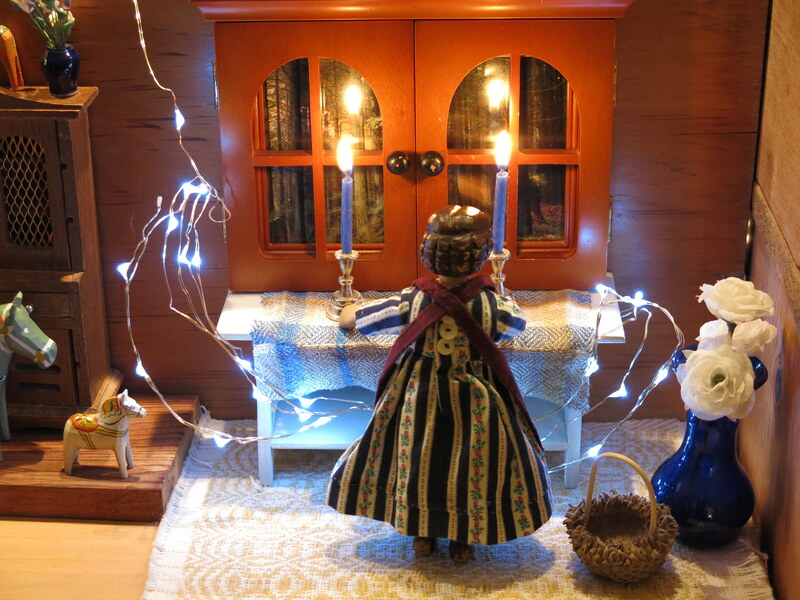 Happy Finnish Independence Day to all in the Quimper Cupboard and their human! The Reindeer Saga was fun – a good way to spend the pre-holiday crazy time!